Home / -Preview- / 6 String Drag / Preview / 6 String Drag Releasing 20th Anniversary Edition of "High Hat" and New Album, "Top of the World"
6 String Drag Releasing 20th Anniversary Edition of "High Hat" and New Album, "Top of the World"
“There was a feeling back then of promise and that you might actually make a living at music someday. I’m not sure if 6 String Drag ever expected to play any stadiums, but we thought me might make a living in an NRBQ kind of way.” — Kenny Roby, frontman for the band. That they consistently did for Top of the World, crafting 11 gems that are both unique in their own right and uniquely 6 String Drag, from pumping opener “Never Turn My Back on You Again” and the pub-rocking, rebels-kinda-with-a-cause “Small Town Punks,” which finds Roby vividly recalling his younger self (“Ya see, there was no formal plan/ We would fall out of the van/ Into the street/ High as a kite/ Fly up I-85/ Learnin’ cool from other scenes/ And pollutin’ other dreams/ For somethin’ new…” and “The path of least to be/ With the freaks of the scene/ And the small town punks like me”); to the raucous, handclaps-and-Hammond-punctuated raver “Every Time She Walks on By” and the jangly, midtempo “Be Like You,” whose sweetly luminous arrangement masks a darkly cynical domestic tale (“All of the kids/ Know it can’t be onions/ They heard her cryin’/ “In the bathroom too” and “This story could go on for generations/ Chemical breakdowns/ And other small clues… A little luck and she’ll be like you”). The album also features guests John Ginty on keys/organs and Matt Douglas on horns. Ginty has been a member of or played in the studio with Robert Randolph, Whiskeytown (Stranger’s Almanac), Neal Casal, Citizen Cope, Jewel, Allman Brothers, Government Mule/Warren Haynes and currently the Dixie Chicks. Matt Douglas is a touring and recording member of Hiss Golden Messenger and Mountain Goats and also played on 6SD’s Root Rock ‘n’ Roll and on Roby’s Memories & Birds. By the time 6 String Drag was ready to record High Hat in late ’96, the alt-country scene was raging, with No Depression-championed artists like Wilco, Son Volt, Whiskeytown, the Bottle Rockets, and the Old 97’s all having released key records. 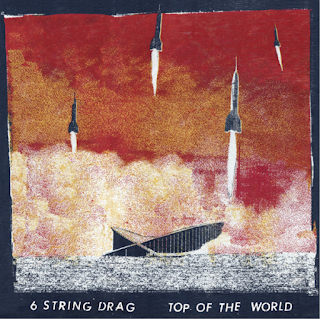 6 String Drag, which Roby and Keller originally formed in Clemson, South Carolina, and was named after Stanley Brothers song “5 String Drag,” already had an eponymous album under its belt and was prepared to step up its game for Earle and Kennedy. Along with drummer Ray Duffey and guitarist Scotty Miller, Roby and Keller served up a set showcasing an already-impressive range of songwriting and arranging skills. High Hat has clearly stood the test of time, with highlights then and now including straight-up alt-country rock (“Bottle of the Blues,” “Ghost”), Bakersfield-meets-gospel rock (“Top of the Mountain”), twangy melodic anthemism that wouldn’t be out of place on an Earle or Springsteen album (“Elaine,” Cold Steel Brace”), even modified Dixieland (“Over and Over”). There’s also a bonus track not on the original album, a high ’n’ lonesome cover of the Louvin Brothers’ “Lorene." At the time, reviews were enthusiastic across the board, but by 1998 the members had decided to part amicably, each musician heading off to his own project and new family commitments. Roby and Keller, though, still kept in touch over the years. In 2013, a year or so after Roby’s solo album Memories & Birds was released, Roby invited Keller to guest on bass for a festival date, and they wound up playing a number of 6 String Drag songs. “We had a blast!” remembers Roby. Of the current lineup, Roby has nothing but good things to say about Rodriguez and Davis, who came into the fold in 2014 and 2016, respectively. “Luis and Dan keep the band fresh and injected with a youthful attitude,” he says. “And Rob and I have the foundation and history with the band. That was a great balance on this record. They are both monster players in my book. As noted above, heading in to the Top of the World sessions producer Merritt already had a history with 6 String Drag. Says Roby, “Jason has kind of been like a member of the band on these records as far as input. He gets a voice like everyone else in the band. Jason is very easy to work with as a producer and engineer — he’s super-fast and decisive as an engineer, which is exactly what you want. Looking back upon the nascent Americana scene that spawned 6 String Drag, Roby admits he’s not altogether certain where his band fits in now — and he’s not particularly worried about it, either. “I never knew a ton about the music business compared to a lot of folks in it. I know what I need to know — enough to not jump off a roof from knowing too much! We had a lot of damn fun back then. We still do. But I don't know much about a lot of current twangy or Americana acts — or whatever that even means. I never really did. I always thought us and other bands were just roots-leaning rock ’n’ roll bands that dipped our feet into some traditional music — in the way that the classic American and British rock bands always did.